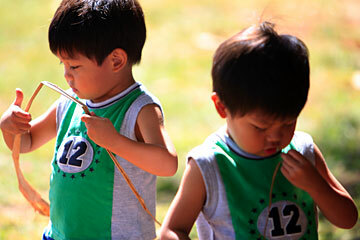 Identical twins Rycin, left, and Reicin Crisostomo played with dried leaves in the sunshine yesterday at Hope Chapel Leeward's annual Thanksgiving Luau on the Waikele Elementary School grounds, where hundreds gathered for good times and good food before the Thanksgiving holiday. 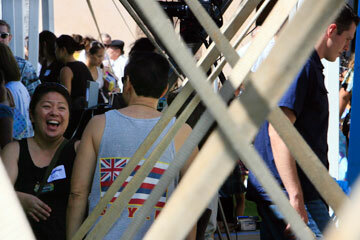 Julie Kurosawa, left, of Aiea shared a laugh with Hilton Ho of Waipahu at Hope Chapel Leeward's annual Thanksgiving Luau. 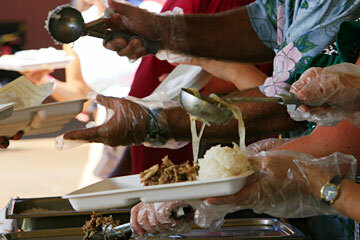 Volunteers busily scooped delectable luau items onto plates.